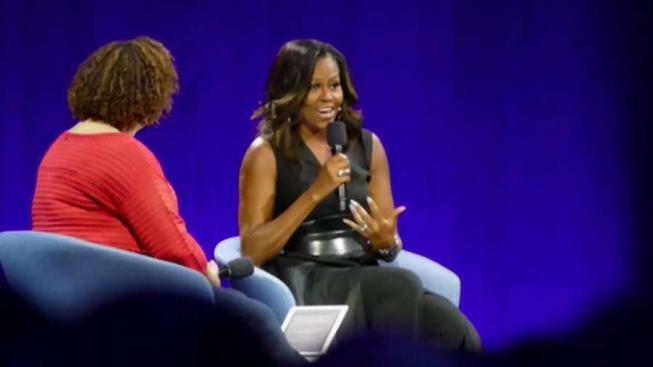 Former first lady Michelle Obama made an appearance Tuesday at Apple's annual Worldwide Developers Conference for a "fireside chat." Bob Redell reports. Former first lady Michelle Obama on Tuesday stopped by Apple's annual Worldwide Developers Conference for a "fireside chat" with CEO Tim Cook. Cook announced the surprise visit Monday at the end of his keynote address to the crowd in San Jose. Obama, accompanied by Lisa Jackson, Apple's vice president of environment, policy, and social initiatives, took to the stage to chat with developers about the role technology can play in "empowering people from all walks of life to make the world a better place." The former first lady talked about life after the White House and delivered some comforting advice on how to deal with fear. "If we let [fear] consume us, then we don't move," she said. Attendees walking out of the discussion also noted feeling a sense of inspiration. "I'm a woman in technology, so she's inspiring in that sense," Leila Navon said. "She keeps telling us to keep working and keep doing what we should do and keep striving to be awesome pillars in our economy and our communities." During her time as first lady, Obama launched several initiatives that focused on themes of empowerment. Her Let's Move! campaign worked to address childhood obesity, Reach Higher encouraged young people in the U.S. to enroll in higher education and Let Girls Learn helped young girls around the world go to school. The conversation with Obama and Jackson began at 9 a.m. PT. The talk was closed to the public and was not be live streamed or broadcast, according to Apple. During the first day of Apple's conference, the tech giant on Monday unveiled its new "HomePod" speaker, virtual reality technology and software developments for its line of products.